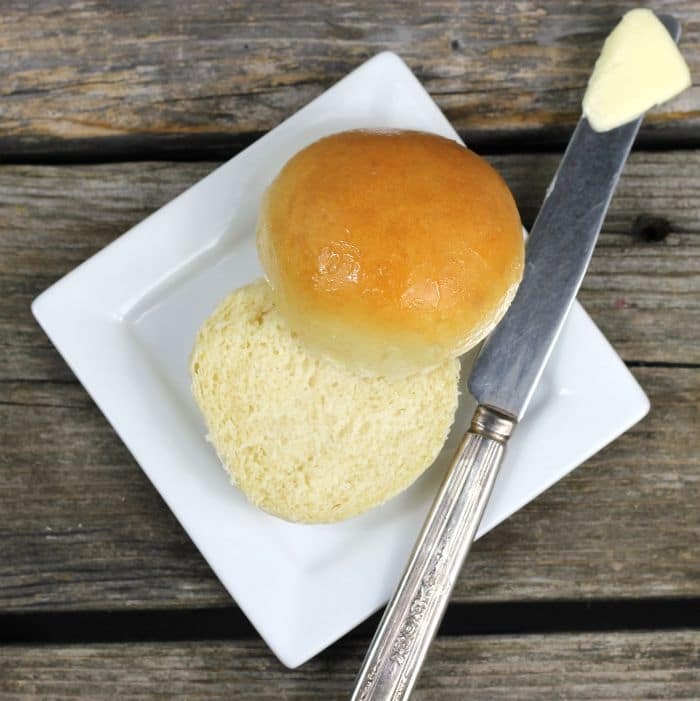 Honey glazed dinner rolls are made with substituting honey for the sugar in the recipe, and after they are baked they are brushed with melted butter and honey. The rolls are a sweet slightly sticky delight. Our daughter got married this past October. At the reception for the meal, the caterers had rolls that were delicious. I heard a lot of people comment on them about how good they were. The tops were just a little sticky and there was a bit of sweetness. We have an upcoming birthday dinner for our daughter this weekend, so these rolls will definitely be on the menu. I am sure I will not hear any complaints about my choice of bread. I have been making bread since my teen years, I learned from the best teacher, my mom. She made bread every two weeks when we were kids. She would make at least 14 loaves at a time. Yep, 14 loaves. Things that my mom taught me about making bread. Always use fresh yeast. Never add too much flour, your bread will come out dry and crumbly. If your house is cool, put some water in the kitchen sink or a larger bowl and place the bowl of bread dough in the warm water, it will help it to rise. In a large bowl add 1 cup of flour, yeast. Heat the butter to about 110 to 120 degrees F in the microwave. Add the milk, butter, and honey to the dry ingredients and mix in with a wooden spoon. Add the egg to the mixture and stir until mixed in. Gradually add the rest of the flour by hand. Knead the dough until smooth and elastic. Grease the bottom of the bowl with shortening and turn over so both sides are coated. Cover and let rise in a warm place for about 1 1/2 hours or when the dough is double in size. Once the dough is doubled in size make into balls and place on a greased baking sheet. Flatten the ball into a disk with the tips of your fingers. Cover the rolls and let rest for 1/2 hour. Once the rolls are done rising place in the preheated oven and bake 10 to 13 minutes or until golden brown. While the rolls are baking place 1 tablespoon butter and 1 tablespoon of honey ina microwave dish and heat until the butter is melted. Stir so that the butter and honey are blended. As soon as the rolls are out of the oven brush with the honey butter mixture and serve. 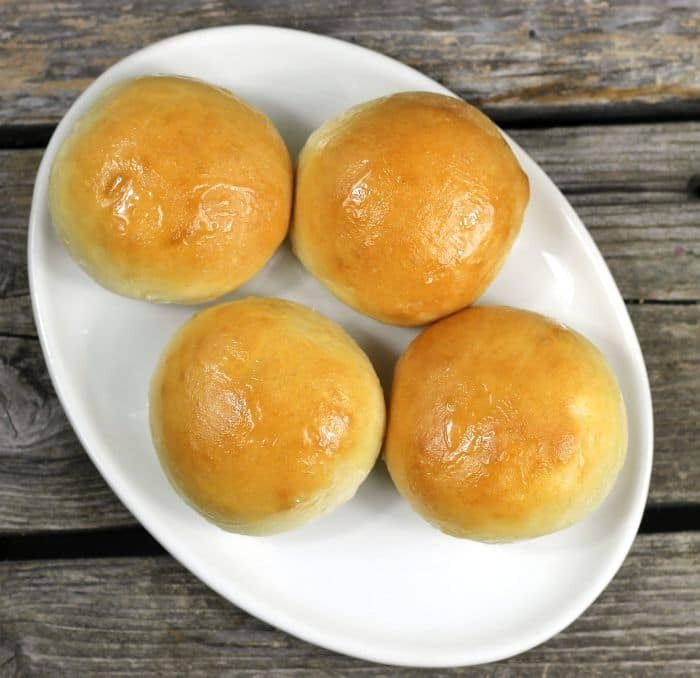 The honey glaze makes these soft dinner rolls even more tempting! 14 loaves!? Wowzers. That’s impressive. Your Mom was basically running a small bakery. 🙂 I love the sound of these rolls, and they’ve inspired me to bake bread again sometime soon. It’s been a while, and bread baking really is my favorite thing to do in the kitchen! Also, happy early birthday to your daughter! I love bread with a touch of sweetness. 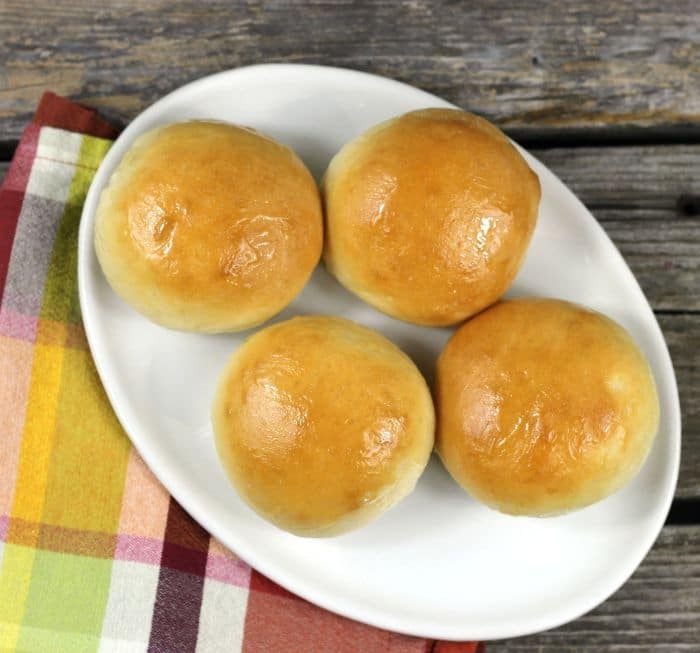 Your glazed dinner rolls look fantastic—I know my family will love them, too! Love bread! 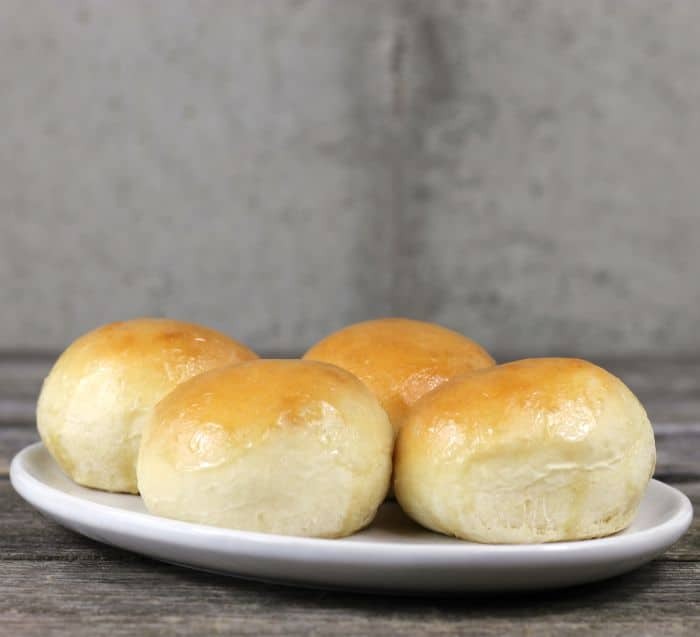 Your glazed rolls look awesome — and I’ll bet taste wonderful. Good stuff — thanks. Coincidentally, I was recently at Disney World, and had these rolls! They were so delicious, I asked for more!